Trust me, the average consumer doesn’t know who owns what. A survey a few years back found that most people thought Disney owned Universal and had no idea Chrysler was no longer an American company. 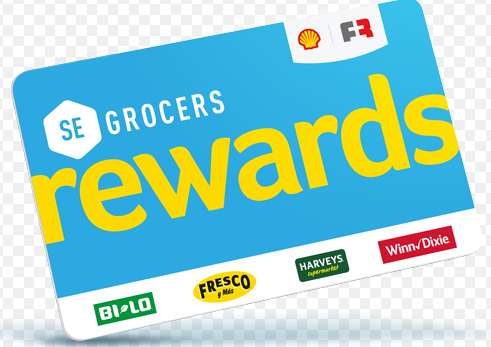 I'd imagine Winn Dixie Customers have to have an idea who the parent company is considering this is what the rewards card looks like. If they don't, they shouldn't have a driver's license. Most people, in fact don’t pay attention to things like that because they don’t have to. I pay a lot of attention to mergers and acquisitions going on because it’s an interest of mine. When I mention a merger going on in the news, 9 times out of 10 the person I mention it to will have no idea what I’m talking about. If you read “The Big Store”, the history of Sears, there’s a whole section about customers were certain Sears was a company located in their part of the country where the closest distribution center was they might have seen like on Ponce in Atlanta. Most had no idea it was a leviathan out of Chicago. Just this week, I was talking with someone about Lucky’s and it’s relationship to Kroger. They had no idea about the fact Kroger operates stores under about 15 names across the country. That’s because to them it doesn’t matter and, for the most part, Kroger doesn’t want them to know. If I go out on the street today and ask a dozen people who owns the Orlando Sentinel, how many do you think would get it right? That seems to be more the photo than anything else. How many customers do you suppose have any clue what “SE Grocers” even is? And if they knew it means Bi-Lo, which is a step below even Winn-Dixie, would that make sense as a premium product? Compare that to Publix branded products, which makes perfect sense because Publix is, in itself, perceived as a premium brand? I'm going to back up and talk about this of a second because this example is all over Winn Dixie. I know you said its the photo, but the WD brand looks very outdated and price being the same, the SE Grocers brand appears more upscale just by the labeling alone. And there's examples all over the store of this. Them shifting to the SE brand as their house brand is an image boost without really doing a whole lot not to mention the cost savings of having one label across all their brands of grocery stores. To your other point about it not being obvious that the parent company is SE Grocers, they're not exactly hiding it. You do have to pay attention to the Kroger/Lucky's relationship because by design Kroger Prefers you didn't know that because grocery stores are very brand loyal. Just like the Albertson's/Safeway relationship. SE Grocers doesn't seem to care that you know the four brands are the same parent. Could that be why SE Grocers has been in bankruptcy twice and Kroger hasn’t? Maybe Kroger just understands the business better. Whether or not some middle aged housewives know or even cares that the name "SE Grocers" on their jars of pasta sauce or boxes of breakfast cereal refers to the parent company that owns Winn Dixie, something they've informed their customers about by repeating it over and over and over again for months on end over their "Winn Dixie Radio" station that plays constantly over the ceiling speaker system, is pretty meaningless when you think about it. What percentage of Publix shoppers know for certain that Publix is not owned by some other conglomerate? Does the typical Publix shopper walk into the front entrance thinking to themselves "Gosh I'm glad Publix is not a subsidiary of a parent company, because as we all know, generic store brand merchandise is always better quality when the company is not owned by another company." I know that when I walk into a Publix, I'm usually thinking something more along the lines of "Man I hope they're giving away some good free samples of pizza and stuff!!!" Either that, or that a lot of the stuff I need is on sale, given their somewhat higher prices than the Walmart Neighborhood Market I usually shop at. Thank you, you’ve just confirmed my point. What matters is the name you know. Putting “SE Grocers” as the brand name on a product is ludicrous because it’s a name no one knows. Some one failed Marketing 101 there and it explains why their stores are crashing and burning (two bankruptcies and counting). Sooooo..... when a new product comes on the market with a new name that nobody knows, it's ludicrous to name it something new and they should instead use some other established product's name simply because it's familiar? What about the established products back when they were new and their name was unfamiliar? How did they become successful? Not following the logic there. What other name should SE Grocers have put on their products? Winn Dixie? They already have a line of Winn Dixie products. So maybe they wanted to give their customers a greater sense of choice. Hourglass Brewery is aiming for an end of April opening! Good news - it’s been pretty quiet over there. Meanwhile, the city is creating a banner district for Curry Ford West Main Street that includes the Hour Glass developers’ turf. The cannons speak for war! The Curry Ford West board doesn't take kindly to districts not going through the proper channels to name themselves a district. A mixed-use development has been proposed near Henderson and Bumby. Super Arbor Man (aka JFW in his mild-mannered UP disguise) May be required to save some huge trees on the property. Hopefully the locals will band together. I'm ready for the fight!!!! Yeah, I saw that in the article it said that all the proposals showed the trees still there. Arbor Man! I love that. Huh. one option shows townhomes going up behind the existing gas station. I don't know what the point of that would be considering the existing gas station was already demoed and they've only left the convenience store and warehouse. The historic trees on Henderson are NOT represented in those renderings. Looks like the developer wants to cut them down. Yes, they are. All the really big oaks on Henderson are not represented in this rendering. As nearly as I can tell, the trees with the check marks on them appear to be the ones represented in the drawing, while the two with the X's on them, look to be gone. I don't know if the city can prevent their removal or not. I hope they can and do. If not, let's hope sanity prevails and somebody is persuaded to build around them. The good thing is that these are all very preliminary plans right now and according to the article, they haven't even found a developer yet. Anybody know how the land use change hearing went? Fun fact time. About 18 months ago I was outbid on a property adjacent to this proposed project, but those lots really require you to build a specific shape of home. Thus I wasn't too concerned. During the Curry Ford study there were a number of very vocal people talking about this development.